You will be given a Free reference e-book to read which has 688 pages And the test will be based on that e-book. A network professional holding a CCDA certification is someone who is capable of demonstrating all the required skills to design both basic and complex data centers, campus, voice, wireless and security networks. This certification also focuses on broadband access, local area networks (LANs) and wide area networks (WANs) since a strong knowledge about all these is extremely useful in helping you build and envision such complex systems. It should be noted that CCDA certification also works in representing a strong foundation of knowledge in the field of designing Cisco converged networks. CCDA professionals can be expected to be well-trained, knowledgeable and skillful when it comes to designing switched and routed network infrastructures as well as services that involve broadband access and LAN and WAN access for certain business organizations. It is also essential for you to familiarize yourself about service virtualization and the basics of designing, implementing, planning, operating and optimizing networks with the help of modular design while also focusing on relationships between modules. If you are seriously contemplating about earning a CCDA certification, then take note that Brainmeasures, an online certification provider that continue to receive excellent reviews and feedback, is now offering a free CCDA practice course. You will find this practice course beneficial because of its extensive free study guide which thoroughly explains all topics linked to being a CCDA and a free practice test which will allow you to determine the things, skills and knowledge that you need to get a passing rate when taking the certification exam. 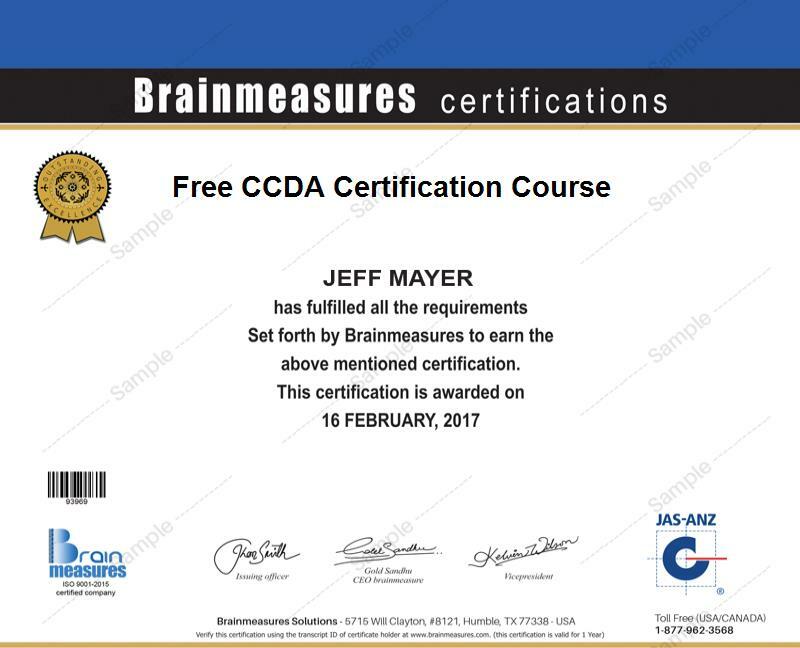 The free CCDA certification practice course which is now introduced by Brainmeasures to the public is proven to be one of the most impressive practice courses provided by the company considering its high level of accuracy and comprehensiveness. One thing that you will notice about this free CCDA practice course is the broadness of its study guide which is also offered for free. It explains in full detail all aspects related to working as a Cisco certified design associate including the steps and procedures that you need to follow when designing the most useful and secure networks as well as the most effective design methods that you can use. The free practice test which is also provided along with the course can also benefit you considering its effectiveness in guiding you when it comes to making preparations for the somewhat complex CCDA certification exam. The free CCDA certification practice course established by Brainmeasures aims to offer help to a wide range of individuals and professionals who want to have an easier time dealing with the complexities and difficulties linked to taking the actual CCDA certification exam. It mainly targets aspiring and practicing network design associates, technicians, support engineers, design engineers and other professionals who are in charge in enabling the most efficient environments for a network through their broad understanding about the fundamentals of network designing. Receiving a CCDA certification can also help you in making positive changes in the level of salary that you regularly receive. Your certificate will allow you to work as a network design engineer and enjoy an average annual salary of $87,000. It would also be easier for you to grab the position of a certified design associate which will enable you to earn approximately $46,000 to $136,000 yearly.